The straight tube structure of ziti makes this pasta ideal for casseroles because it adds bulk and stands up well to the baking process. Using ground beef and ricotta cheese, along with spaghetti sauce, in this recipe creates a lasagna-like flavor. Adjust the seasoning and other ingredients as desired. This casserole calls for a 16-oz. box of ziti, or other tube pasta, and 1 lb. of ground beef. Choose lean ground beef for a healthier version or use ground turkey, pork or chicken. Look for reduced-fat ricotta cheese in a 15-oz. container to lower the fat and calorie content. Other ingredients: a 28-oz. jar of spaghetti sauce, one chopped onion, two cloves of minced garlic, a 28-oz. can of diced tomatoes, basil, oregano, 2 cups of shredded mozzarella cheese and Parmesan cheese. Cook the ground beef, onions and garlic in a skillet until the meat is no longer pink. The onions will be soft by the time the beef is done cooking. Prepare the ziti al dente -- cooked completely but still firm. Drain the ziti, but save 1 cup of the pasta water. Lightly spray a 13-inch by 9-inch baking dish with cooking spray. Pour the spaghetti sauce, diced tomatoes, basil and oregano into the ground beef. Stir the mixture and allow the sauce to heat over medium heat. Add a few tablespoons at a time of the reserved pasta water if the ground beef sauce is too thick to spread easily. Continue adding small amounts of the water until it reaches the desired consistency. Spread a thin layer of the meat and sauce mixture in the bottom of the pan. Top it with 1/3 of the cooked pasta. Stir together the ricotta cheese and mozzarella. Spread 1/3 of the cheese over the pasta. Repeat the layers, ending with the remaining meat mixture as the top layer. Sprinkle the top of the casserole with Parmesan cheese. You can also sprinkle on additional shredded mozzarella if desired. If you don't want to mess with layers, gently stir all of the ingredients together in a bowl and pour into the baking dish. 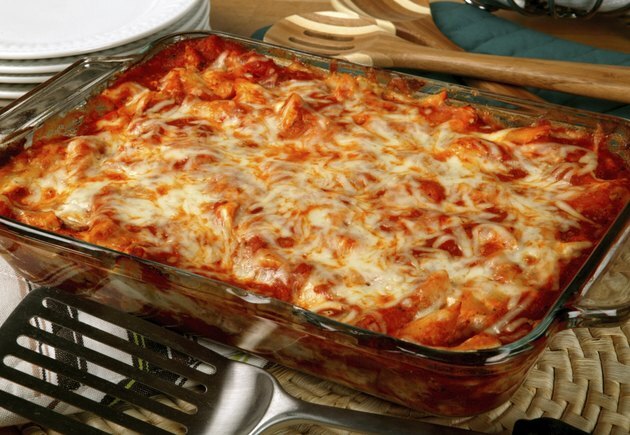 Preheat your oven to 350 degrees F. while you are assembling the ziti bake. The baking time is 30 to 40 minutes. The casserole should be heated through with the cheese melted between the layers. If the casserole was prepared previously and the ingredients are now cold, allow for an additional 10 to 15 minutes of baking time. Serve the baked ziti with bread sticks or toasted bread.